Winter art and crafts are in full swing now! If you haven't had any snow yet this year read the story 'The Snowy Day' and be inspired to create your own winter art. Toddlers and preschoolers will love making painty tracks as they create their own snowmen and snowflakes. Put any corks lying around after the festive period to use and use them to paint with! 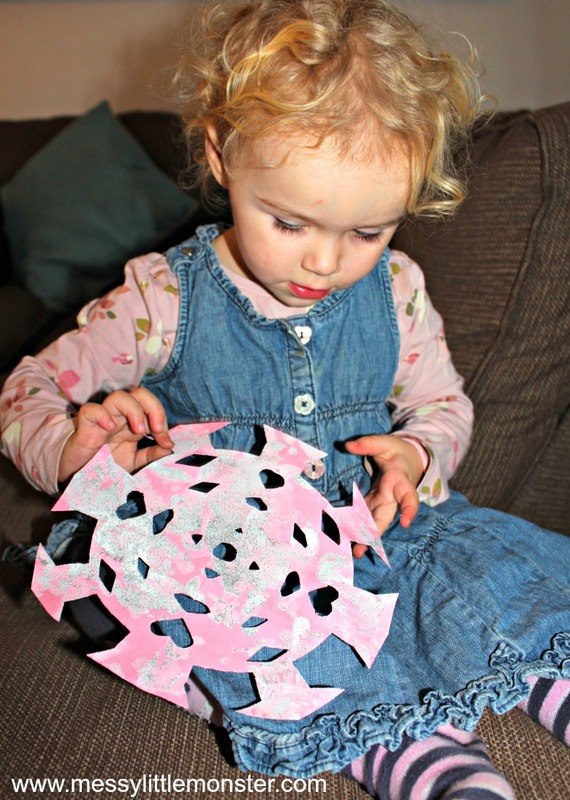 We have lots more snow themed art and craft activities for you to take a look at. One of my favourites is our puffy paint melted snowman. This weeks book for the virtual book club is 'The Snowy Day' by Ezra Jack Keats. It's a lovely story about a little boy and his adventures as he goes out on a snowy day. Amongst other things he makes tracks in the snow, builds a snowman and watches the snowflakes falling. (scroll down for more 'The Snowy Day' activity ideas) Take a look at our Winter book list for other book ideas too. 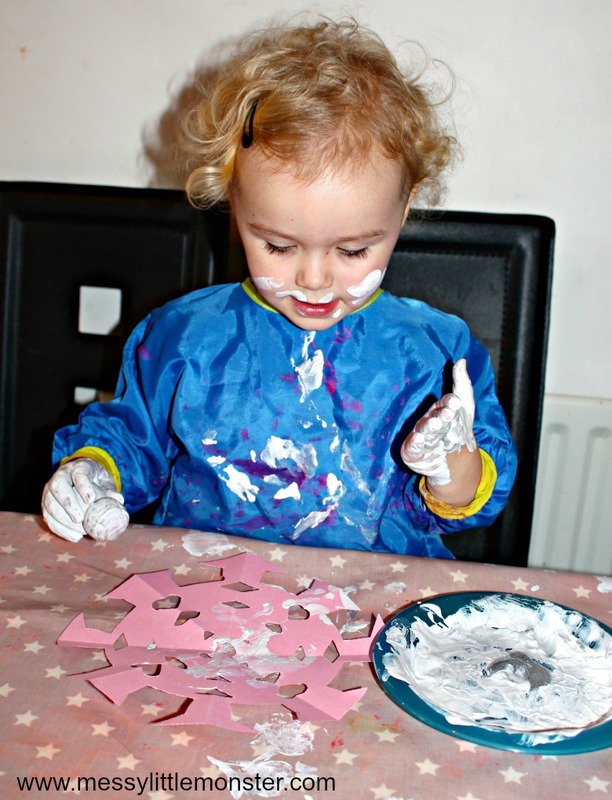 Even the youngest toddlers can have fun creating some winter art based on this story. 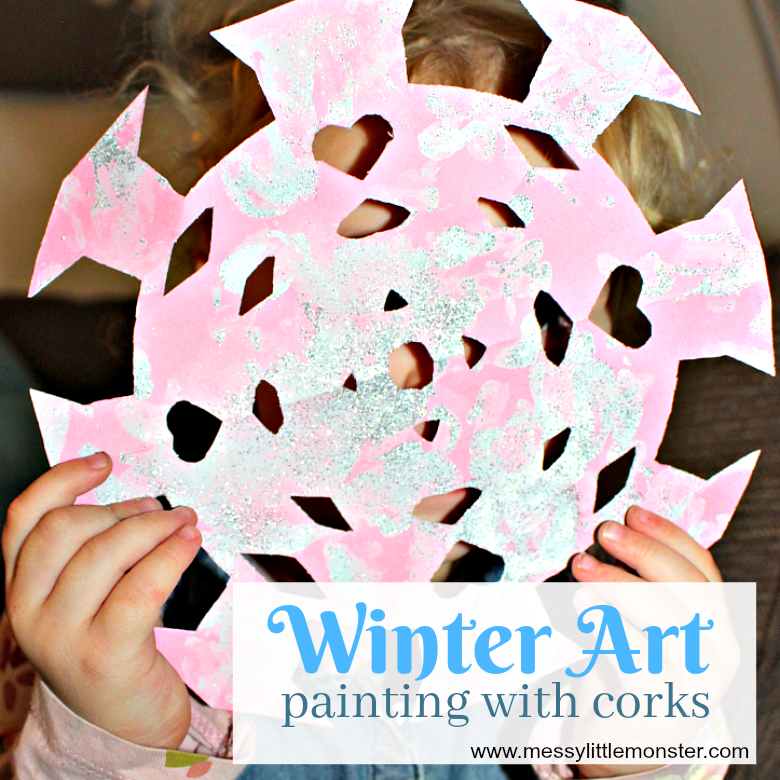 Using just corks with white and silver paint to make tracks young children can easily create their own snowmen and snowflakes. Toddlers and preschoolers will love seeing the patterns that the corks dipped in paint can create and each piece of completed artwork is unique and the child's own work. To prepare this activity cut out some simple shapes from card. We cut out a snowman and a snowflake. You could use any coloured card for this activity, I personally think pastel colours work well and Daisy (aged 2) was very sure that she wanted a pink snowman and snowflake. 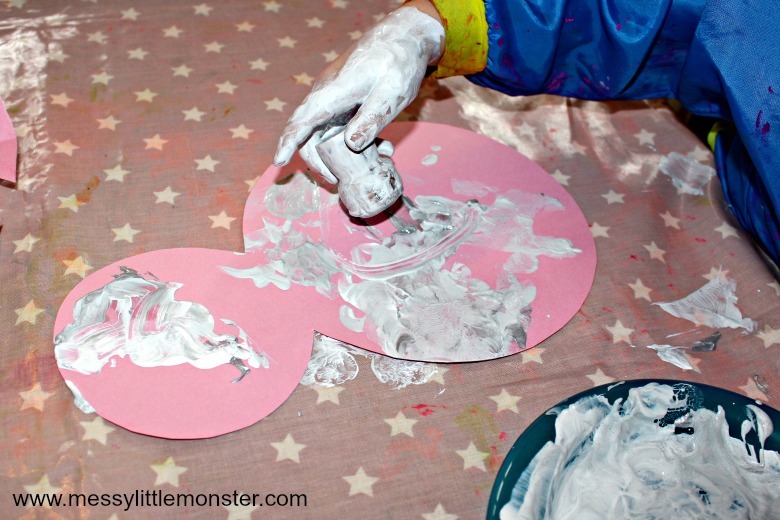 Prepare white and silver paint on a plate and add a cork for your child to print with. We used silver glitter paint too to add a bit of extra sparkle. 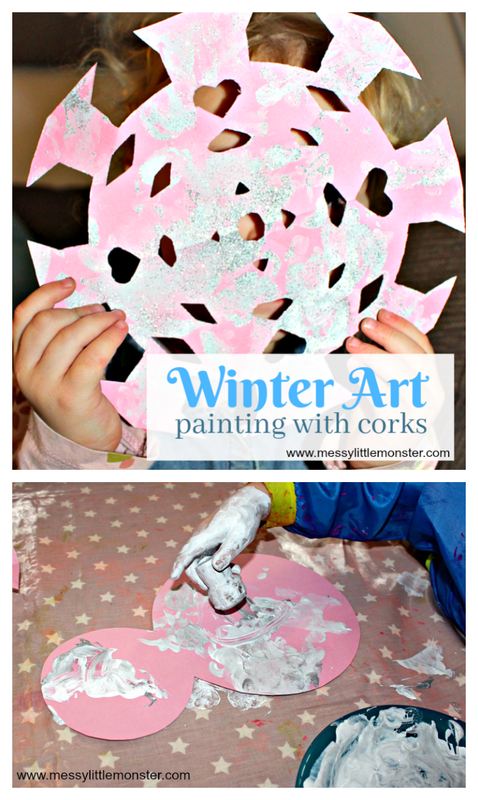 Let your child dip the cork into the paint and print with it onto their Winter shapes. They can make tracks like the little boy in the story or just have fun experimenting with printing. They might carefully print circles using the end of the cork or decide to roll the cork across the winter shape. 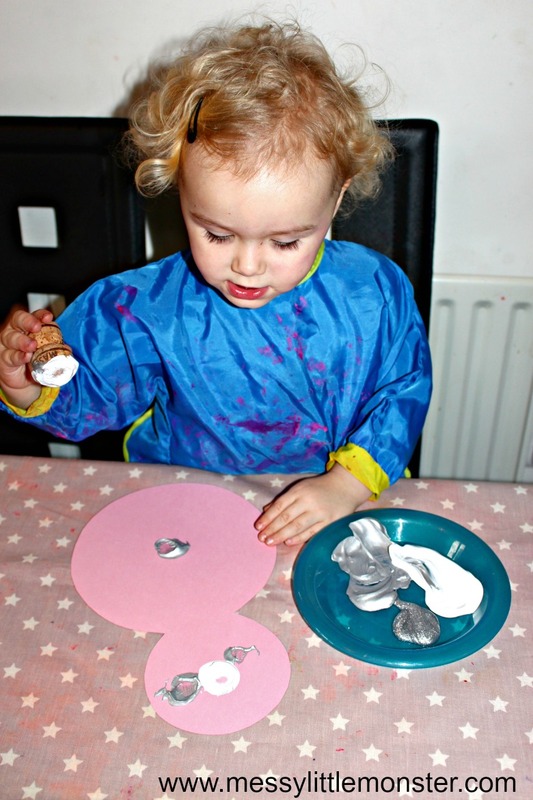 Once your child has finished printing with the cork add a snowstorm of glitter to add a little sparkle. You won't need any glue as the glitter will stick to the paint. 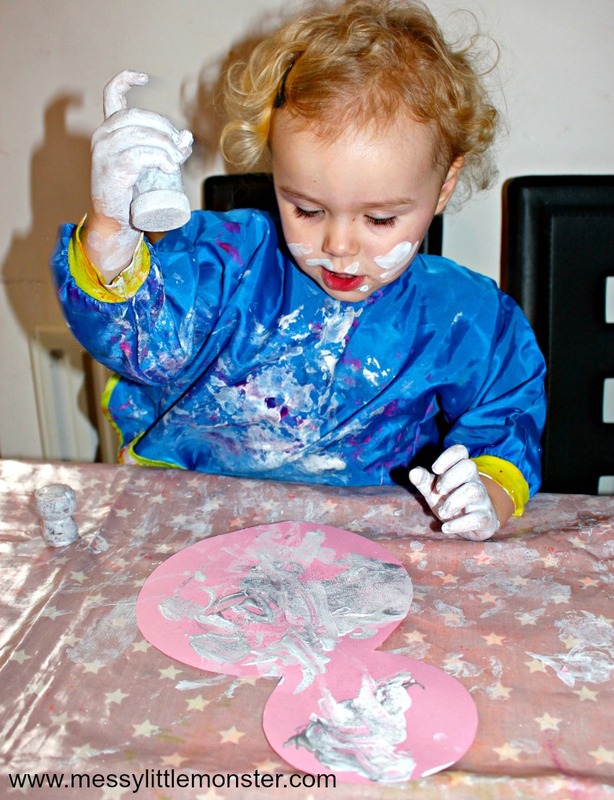 Your toddlers Winter artwork is complete! Daisy was very proud of hers! 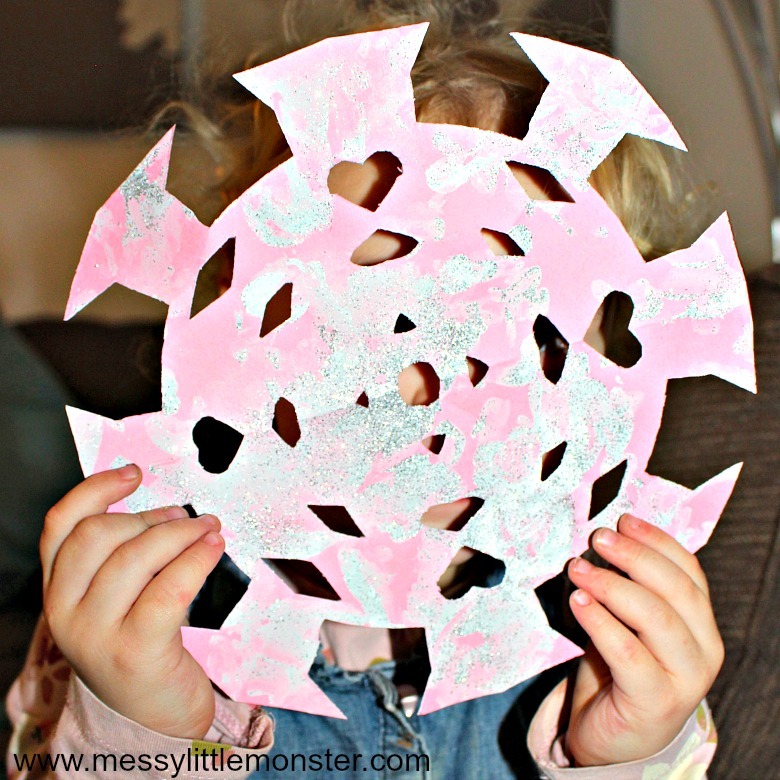 If this activity is too messy for your little one, or you have ayoung baby or toddler still putting things in their mouth you might prefer to try our no mess paper plate snowflakes. For more fun book activities follow the virtual book club facebook page. See all our snow activities here or take a look at the activities from other websites below. Follow us on Facebook, Pinterest, Twitter, Instagram, Youtube.